The Community Webs cohort of public librarians kicking off their program at the Internet Archive on November 3. 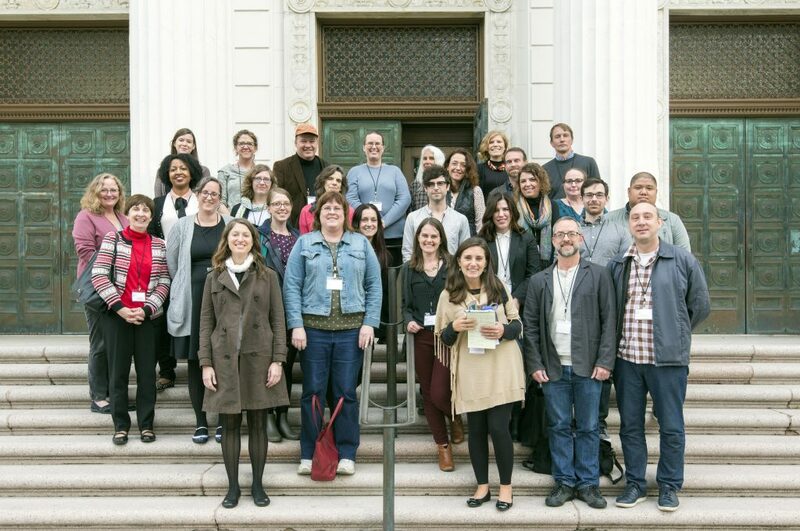 The inaugural cohort of 27 Community Webs partners gathered at the Internet Archive last week to meet one another, share their goals, and begin their two-year program to incorporate web archiving into local history collections around the country. Watch this space and the Archive-It blog for updates from the cohort and Internet Archive staff on their progress, lessons-learned, and new open educational resources. Calling all web archivists: it’s that time again! The National Digital Stewardship Alliance (NDSA) Web Archiving Survey tracks the evolution of web archiving programs and activity in the United States. Any United States organization involved in web archiving or in the process of planning a web archive is encouraged to take the survey before it closes on November 17, 2017. Results and observations from the three previous surveys (2011, 2013, 2016) are available. Web archivists are meeting ambitious new partners in the nationwide efforts to keep web-based climate information resources online and accessible. A conversation among Archive-It partners about possible scopes, roles, and goals in web archiving climate change and its effects began this summer and will benefit from your input. To catch up with and join this community, start with this new blog post by Archive-It partner Laura Alagna: Web archiving climate change: A call for community documentation strategy. Partners at the University of Nevada, Las Vegas are coordinating with local memory organizations to archive materials related to last month’s tragedy on the Las Vegas strip. To learn more about how they are responding to the event and soliciting contributions from the public, including web-based materials, see the UNLV Special Collections and Archives blog post: Remembering 1 October: A Collaborative Initiative to Document the Tragedy and Response. Gemma Batson joined the Archive-It team this summer to steward our growing community of partners in Europe, so we took a moment to get to know her, her path to Archive-It, and future plans across the pond: 5 Questions with Program Manager Gemma Batson. Senior Data Engineer Vinay Goel operates the Wayback Machine at the Internet Archive’s annual open house event in October. Archive-It’s Google Analytics integration provides you with regular statistics on the volume and behavior of visitors to your collections on archive-it.org. To explore a rich case study in collecting and parsing out this information, see the new blog post by partners at the U.S. Government Publishing Office: Understanding web archive access and use with Google Analytics: Lessons and questions from the Federal Depository Library Program. The Archive-It Advanced Training webinar series continues with Archiving Social Media on November 14 and our regular Advanced Scoping training on December 5, both at 11AM Pacific, 2PM Eastern. Please use this form to register for either or both live webinars. Miss a webinar or want to revisit something you learned? Recorded webinars are also available here in the Archive-It Help Center.